I wake still lying on the hut floor. A hut not like the others. This one big, with many rooms, all cold. Hence the floor. The decision to sleep in the main room next to the stove had been a no brainer. I lie listening to the fall of boot on wooden floor as the others gather their gear and head out of the door intent on their Alpine start. They’re off to bag a top. Their desire to bag it is the main reason we’re in the hut and not a tent. I’m more than happy to skip the dawn activity. There are enough kilometres left to satiate my wonder lust without adding on side branches. 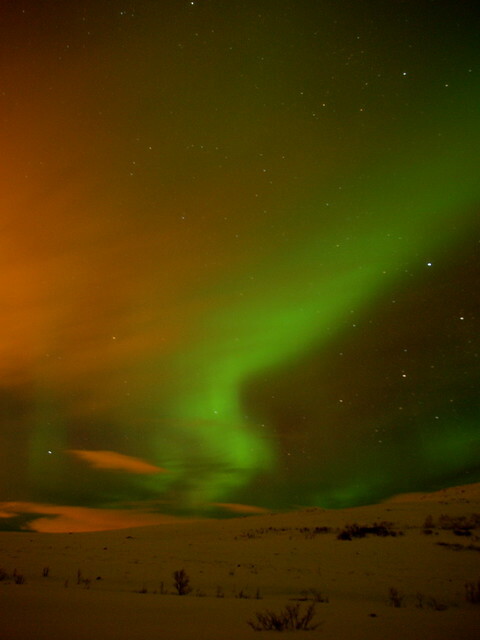 Besides, I’d been up late, revelling in our second showing of the Northern lights and life doesn’t deal me a lot of lie ins. Even this bone chilling, backbreaking wooden floor holds and undeniable attraction. Fifteen minutes later I’m up and about anyway. The stove is lit, just a couple of logs, enough to blunt the airs edge, and there’s a kettle on for porridge and a brew. Glowing like a Ready Brek kid I pack my kit for the last time. Carefully and methodically. For once without haste. Done and dusted, I head outside with my camera and am met with partial views. It’s reasonably open to the North under low patchy cloud but the tops to West and East are closed in. I imagine the boys up top squinting into the mist and am glad I stayed low. A half our later the others are back and, after a warm and a brew, are packing up. 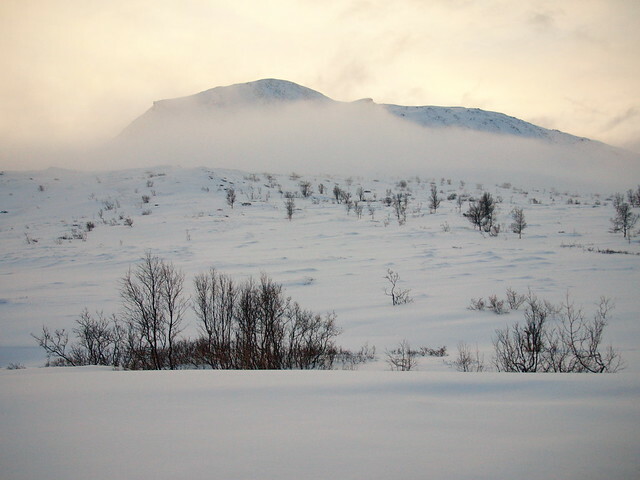 By the time we leave the hut the cloud is lifting. No longer obscuring the view it hangs in swathes adding interest to the scene. It's going to be another fine day. 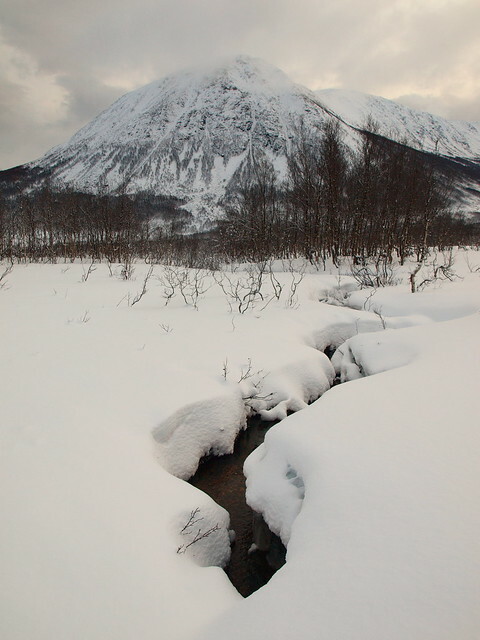 It's going to be that much harder for me to say goodbye to the high North. The walk out is to be simple. 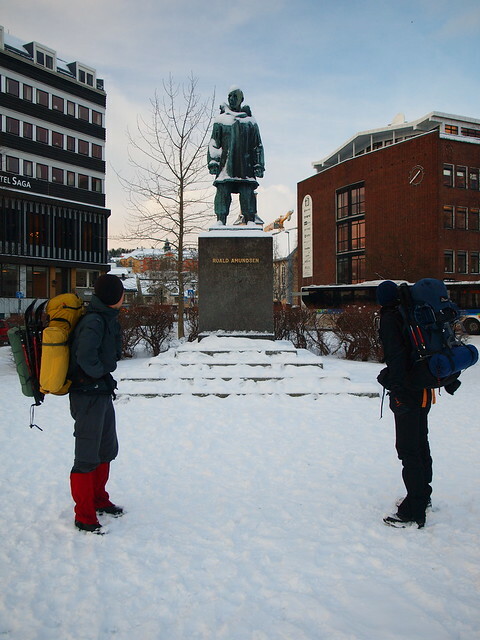 All down, all way marked, all the way to Snarby eidet and the road where we hope to catch the bus out of Oldervik. When having fun however, hikers fly and we find ourselves, regardless of all those stops to take photographs, at the road an hour early. Dilema! One hour before the bus leaves Oldervik and five kilometres of road. 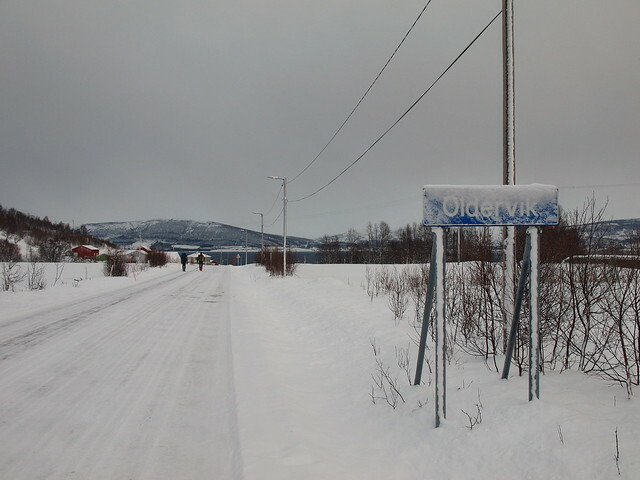 The question is do we sit and shiver or do we sprint to Oldervik. 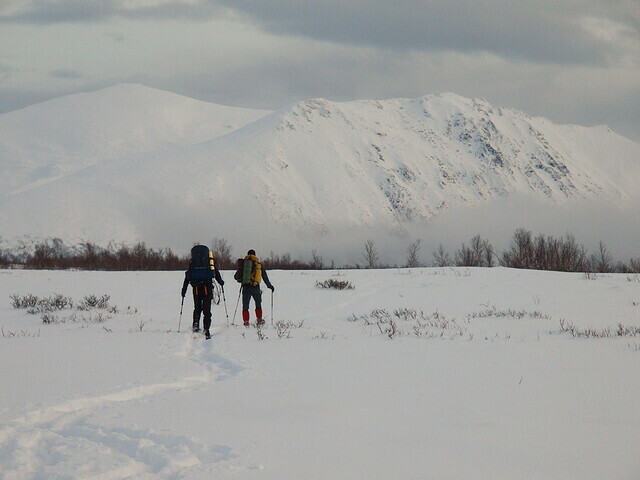 The latter gets the vote and, after strapping snow shoes and sticks to packs we stride off down the road. Road walking’s not usually my thing but it occurs to me as I thunder forwards that this road walk has something going for it; it will take us back to the coast. The route, unintentionally, has become a sort of coast to coast. There’s something about that that appeals to my compulsion for symmetry and order. Some trips just peter out. This one will stop, literally, at the end of the road where the tarmac meets the dark Northern waters. The tail of this route becomes both a bout of stiff exercise and a gentle re-entry into the world. Another positive of road walking is that you spend less time looking at your feet. With no alarms and no surprises you’re free to look up. I watch, with fascination, as the trappings of civilisation roll towards me. First come the widely spaced houses accompanied by the sound of barking dogs. Then come the overhead cables. Then the speed restrictions making the edge of the village. Then the houses get closer, then bunch up and all at once we’re in the village. With ten minutes to spare before the bus leaves we dump packs in the shelter and wander round. 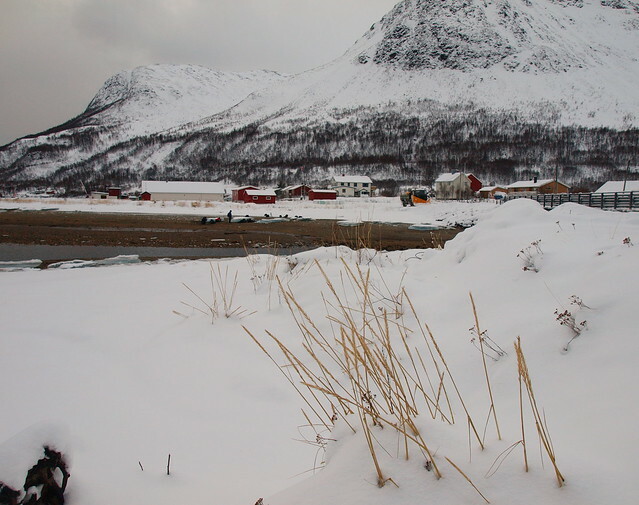 I head down, past the racks of air drying cod fish to the beach. It’s a fascinating place. I’m confronted by a sea, improbably open for this improbably Northern latitude. What a different place this would be where it not for Mexico’s gift of warm water. 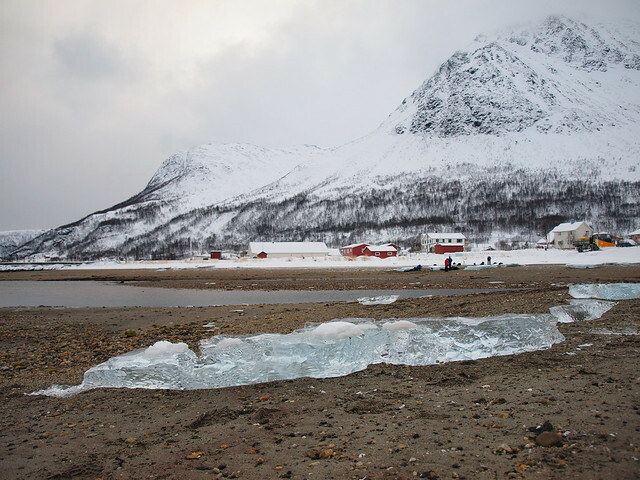 The beach, wide and stony, is studded with large blocks of ice. Not sea ice but fresh water ice lifted from the river mouth and placed artily by the rise and fall of the tide. I walk to the waters edge and, in lieu of a toe, dip the tip of my vibram. Job done. Then there’s just the bus. 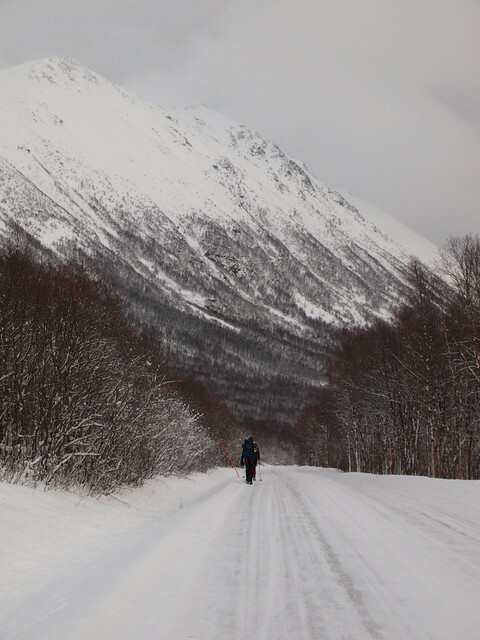 A few short minutes of rewind has us speeding back past the trail head at Movik, then back through Kroken and finally over the bridge into Tromso. The bus spits us out under Amundsens monument and, after a few moments of reflection stood at the foot of this man amongst men, we head off to look for a grill-polse (with bacon!) and the bus to the airport. enjoyed your journey, already looking forward to the next one, but it's nice to be back home. All of those pictures were great! Wow! Glad you like everything so much! I admire your perseverance and attitude to climb that mountain, very inspiring!